Second-year pro Anthony Roux squeezed across the finish line in stage 17 of the Vuelta just a few seconds ahead of the peloton to claim an unexpected but well-deserved lone win. The only survivor of a break of five, Roux (Francaise des Jeux) spent no less than 187 kilometres of the 193 kilometre run from Ciudad Real to Puertollano off the front. The move had seemed condemned to failure, particularly when some of the five – Roux was one of the exceptions – started attacking close to the finish. This was not the most intelligent of ideas given the bunch was at less than 30 seconds! Holland’s Martijn Maaskaant (Garmin-Slipstream) succeeded in going clear, and Roux finally followed him up the road, catching the Classics specialist with two kilometres to go. A final short uphill put paid to the burly Dutchman, but Roux somehow found the strength to accelerate away and take Francaise des Jeux’s first stage win of a major Tour this season. B-Box’s William Bonnet finished second, making it a French one-two, whilst Andre Greipel (Columbia-HTC) took third, strengthening his lead in the points competition. Overall there was no change, but a big pile up in the first half of the stage saw second-placed Robert Gesink (Rabobank) and sixth-placed Ezequiel Mosquera (Xacobeo-Galicia) both hit the deck. Gesink suffered cuts and bruises down all of his left side, whilst Mosquera had a head injury and scraped his hip. Both riders could continue, but as Mosquera’s sports director Alvaro Pino pointed out, the injuries could hardly have come at a worse time. On Thursday the Vuelta heads back into the hills and the race favourites will have one of their last chances to dislodge Alejandro Valverde (Caisse d’Epargne) from the lead. If two of his key rivals are not feeling at 100 percent, that will make the Spaniard’s mission of holding onto the maillot amarillo a lot easier. 10. Borut Bozic (Slo) Vacansoleil all same time. 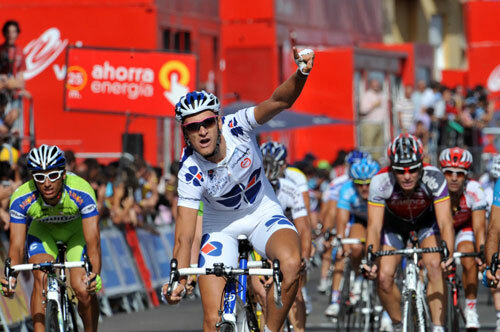 Vuelta a Espana 2009: Who will win?